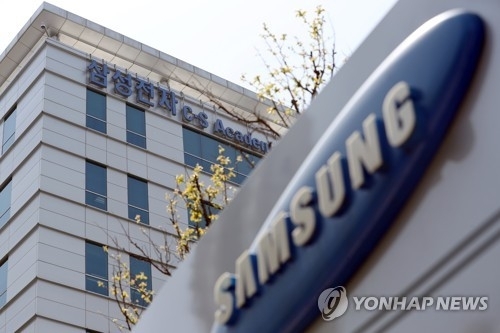 SEOUL, Aug. 10 (Yonhap) -- A former vice president of Samsung Group's now-disbanded decision-making body was grilled by prosecutors Friday over alleged involvement in a scheme to hamper labor union activities of employees at a Samsung Electronics Co. subsidiary. The Samsung official, identified only by his last name Kang, is accused of ordering the scheme to sabotage labor union efforts by Samsung Electronics Service employees and receiving reports about the results in 2013, according to the Seoul Central District Prosecutors' Office probing the case. He served as a vice president of Samsung Group's Future Strategy Office in charge of labor-related affairs at the time. Kang, 55, refused to take questions from reporters as he walked into the prosecution office in southern Seoul. Prosecutors are investigating allegations that Samsung's management was involved in the alleged organized scheme aimed at toppling the labor unions at the tech giant's after-services unit. Samsung is known for its "no labor union" policy. Prosecutors have obtained evidence suggesting that another then-Samsung executive, surnamed Mok, sent Samsung Electronics Service documents containing detailed action plans for sabotaging the union activities. Mok, who was arrested on Monday, used to work in the personnel affairs team at Samsung Electronics and Samsung's strategy office. Prosecutors are expected to soon decide whether to subpoena Lee Sang-hoon, incumbent chairman of Samsung Electronics' board of directors, over the allegations. He was chief of the tech firm's management division when the labor union was being set up.